"I'm going to show you what I think is the best method for making this incredibly delicious Greek yogurt and garlic sauce. One of the world's great snacks, an all-purpose condiment, this is just good on so many things. I serve mine with some homemade pita bread. As always, enjoy!" Sprinkle grated cucumber with 1/2 teaspoon salt in a bowl and let stand 10 to 15 minutes to draw out juice. Place yogurt into a separate bowl. Dump cucumber and its juice onto a sturdy, dry paper or cloth towel and squeeze as much moisture as possible from the cucumber. Mix cucumber into yogurt. Add garlic, cayenne pepper, and lemon juice; mix thoroughly. Stir dill and mint into yogurt-cucumber mixture; season with salt and black pepper. Adjust all seasonings to taste. Cover bowl with plastic wrap and refrigerate for 3 or 4 hours (or overnight). Transfer to a serving bowl and garnish with a sprig of dill and a sprinkle of cayenne pepper for color. 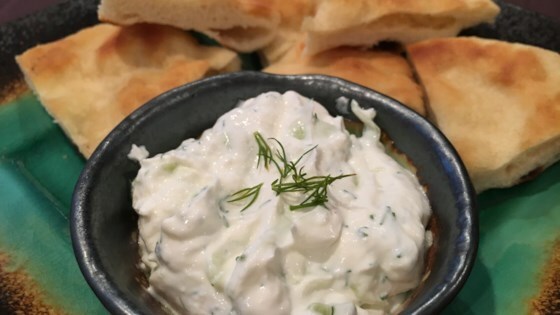 An authentic tzatziki sauce. Simple, good ingredients. I made the recipe according to his directions, wow it was WAY too sour from the lemon and entirely too much garlic.